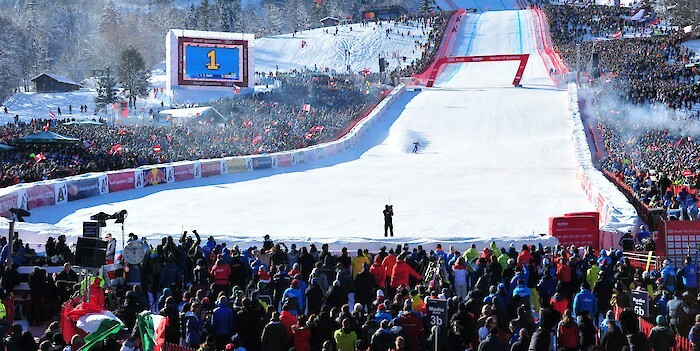 The Hahnenkamm Races 2017 are now history. The 77th edition saw some fair and exciting races with deserved winners again this year, accompanied by picture postcard weather, a magnificent setting and 92,000 spectators over 3 fabulous days. Matthias Mayer secured victory for Austria in the opening Super G event. The Carinthian triumphed just ahead of Christof Innerhofer (ITA) and Beat Feuz (SUI), celebrating his first World Cup victory after his nasty fall last year, as well as his first success in Kitzbühel. Mayer’s triumph was also the first ÖSV (Austrian Ski Assoc.) win in the Super-G discipline since 2009. „Winning in Kitzbühel is a childhood dream come true“, said the Downhill Olympic Champion of 2014. Dominik Paris was the big winner of the Downhill on the Streif. The Italian conquered the Streif in 1:55.01 minutes, beating off the two French athletes, Valentin Giraud Moine (+0.21) and Johan Clarey (+0.33) in the process. This is the third triumph in Kitzbühel for Paris. In addition to the Downhill races of 2013 and 2017, he also won the Hahnenkamm Super-G in 2015. He was the last to win at the Hahnenkamm on the original racecourse length of 3,312 m four years ago, which applied again this year. "Amazing! I didn’t think I was going to end up here on the winner’s podium. It is one of the nicest races that we have, if not the nicest” said Paris. Austria enjoyed another victory at the ensuing Slalom on the Ganslernhang. Marcel Hirscher skied from ninth place to victory in the second run and triumphed ahead of Dave Ryding (GBR) and Alexander Khoroshilov (RUS). It was the second win in Kitzbühel since 2013 for the five-time Overall World Cup winner. „I am speechless that it was enough to win. I skied flat out in my second run and delivered a „Rock n‘ Roll” performance. It is incredible! To win in front of these audiences is truly, truly fantastic“, said Hirscher after his second run pursuit mission. Dave Ryding enters the history books by coming second: He is the first British skier to achieve a podium position in Kitzbühel since the World Cup’s inception in 1967. Gordon Cleaver (GBR) was the only other skier to achieve similar success at the Hahnenkamm Races, when he won the Combined event in 1931. In men’s skiing overall, it is only the second podium position ever for Great Britain in the World Cup. The first was achieved by Konrad Bartelski in 1982, when he came second in the Downhill in Val Gardena.